How can I get to The Peak from Golden Crown Guest House by MTR? and how much it costs? hoping to enjoy our trip as well :) thank you so much for all your help. and more power! Getting to Golden Crown from Causeway Bay is quick and easy thru MTR trains. Here's the train route map between Causeway Bay and TST MTR station. Hope it helps and have a safe trip to HK! thanks so much for your inputs. one last question pls. how do i get to Golden Crown from Causeway Bay? thanks! Question: Is the Star Ferry's Harbour Cruise located at the TST Star Ferry Pier? How much does it cost? Answer: Yes, it is located at the TST Star Ferry Pier, just go there to book. The timing and pricing can be read in our HK harbour page. Answer: I suppose you wanted to know the direction from HK Disneyland to Golden Crown. Take the MTR trains from Disneyland Resort station --> interchange at Sunny Bay station to the Tung Chung Line --> interchange at Lai King station to the Tsuen Wan Line --> get off at Tsim Sha Tsui station Exit D1. Train travel time is 39 minutes @ HK$17. Question: Directions from Ocean Park to HKIA please? Answer: Please read in one of our page here that discussed about how to get to Ocean Park from Hong Kong airport and you may follow one of the direction mentioned in there in reverse order. I would recommend a taxi though. The first trip from HK to Macau and Macau to HK is 7:00 am and last trip is at 22:30 pm with a frequency of every 30 minutes. 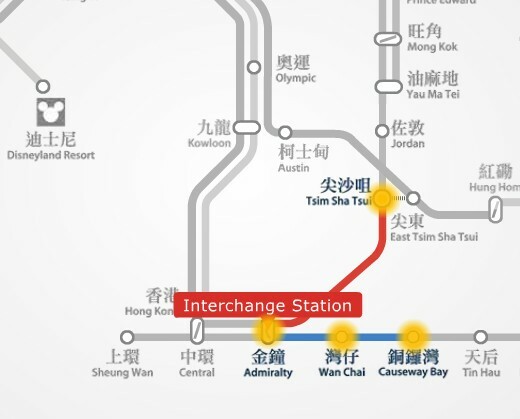 Take MTR trains at Tsim Sha Tsui station, Entrance / Exit D1, D2 or A2, look for the Tsuen Wan Line trains heading towards Tsuen Wan and get off at Lai King station then interchange trains to the Tung Chung Line towards Tung Chung, 38 minutes - HK$ 13.8. Walk about 5 minutes and follow directional signs heading to the Ngong Ping 360 Cable Car Tung Chung terminal. Take the cable car from Ngong Ping Cable Car Terminal adjacent to the Tian Tan Buddha Statue to Tung Chung Cable Car Terminal (opposite side). Close to the cable car terminal is the Tung Chung MTR station. Take the MTR trains and get off at Sunny Bay station (next station) then interchange trains to Disneyland Resort line (18 minutes train travel / HK$11.3). i read a lot of pages here on this site to be able to get travel directions on our hk trip. pls advise if i got it all correct and pls provide directions on the ones that i cant find. thanks in advance. Golden Crown Guest House is conveniently located at 5/F Golden Crown Court, 66-70 Nathan Road, Tsim Sha Tsui, Kowloon, Hong Kong. Find Airport Shuttle Bus Number: A21, which terminal is called Hung Hom KCR Station which is located near the Arrivals Level (Level 5) of Hong Kong International Airport. A fare is HKD $33(free of luggage fee). In 40 - 80 minutes (depends on traffic situation) you will reach to the Bus Stop No.13 - the name of this Stop is called: MTR Station (Tsim Sha Tsui), Nathan Road. Your itinerary is good and very doable. -Get to Ngong Ping early in the morning to start your Disneyland Tour at noon 'til the "Disney in the Stars" fireworks at 8pm.